It’s always good to question what we do, why we’re doing it and how we might do things differently. This involves looking beyond ourselves to what others are doing, both in New Zealand and internationally. 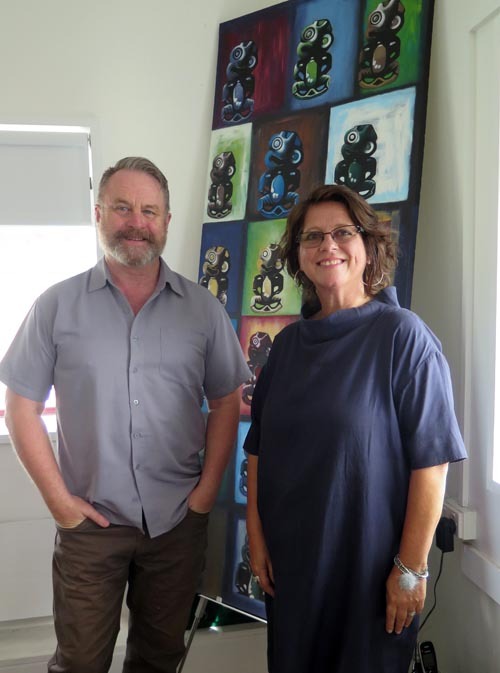 Jacqui Moyes, Arts Access Aotearoa’s Arts in Corrections Advisor, continually seeks opportunities to research and extend our knowledge of this sector and partner with others to facilitate innovative projects. 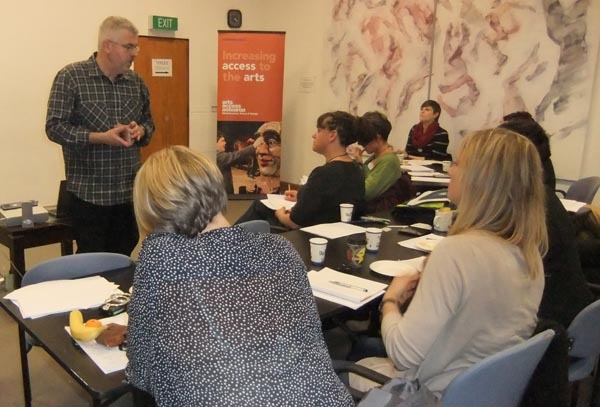 For example, the 2014 creative writing workshop in Wellington with UK writer and youth justice worker Michael Crowley resulted in the formation of Write Where You Are. This group of four writers do fantastic work teaching creative writing in prisons. Then in 2015, American Curt Tofteland visited New Zealand as the fifth Creative Fellow of the University of Auckland’s Creative Thinking Project. The founder of the Shakespeare Behind Bars programme, Curt spoke at Creativity in Corrections forums and worked at Northland Region Corrections Facility to help establish a Shakespeare Behind Bars programme there. And in 2016, Arts Access Aotearoa partnered with the Goethe-Institut New Zealand so we could benefit from the expertise of German theatre practitioner Uta Plate. As well as presenting at three Creativity in Corrections forums, Uta led a week-long theatre project with women in Arohata Prison. Now, we can benefit from the wisdom and experience of Canadian Professor Sylvie Frigon from the University of Ottawa, on sabbatical at Victoria University in Wellington. You can read more about her in Canadian shares expertise on confinement and creativity. In New Zealand, an innovative partnership has developed between the New Zealand Festival and its Writers and Readers Week, Write Where You Are, Arts Access Aotearoa and the Department of Corrections. On 8 March, up to 80 guests will participate in an interactive creative writing workshop with men from Rimutaka Prison. In the lead-up to the event, the prisoners are participating in six creative writing workshops, facilitated by Write Where You Are. This is an opportunity for prisoners to experience a NZ Festival event, interact with guest writers and the public, and showcase their writing skills. Here are some other innovative and exciting examples from overseas, part of a global trend in using creativity to create better outcomes for prisoners. The Hidden Voices Project in the UK aims to strengthen relationships between incarcerated fathers and their children through song. North East Prisoner Family Support (NEPACS) and Helix Arts teamed up to facilitate song writing workshops for children. The four resulting songs openly shared the children’s experiences of seeing their fathers in prison. In addition, the recordings gave their fathers insight into the impact their incarceration had on their families. A toolkit is now available to facilitate creative workshops for children of prisoners. The Ear Hustle podcastlets us listen in on life at the San Quentin State Prison in California. Created by two long-term prisoners, Earlonne Woods and Antwan Williams, and visual artist Nigel Poor, the podcast looks at the light and dark sides of prison life. Episodes are recorded at the San Quentin Media Lab, which also produces a radio station. The podcast was the winner of Radiotopia's new podcast contest in 2016. Rehabilitation through the arts has become a priority in California. The Arts in Corrections programme, a partnership between the California Arts Council and the California Department of Corrections, receives US$8 million in annual funding to operate in 35 correctional facilities. The programme aims to prepare inmates for success upon release, enhance rehabilitative goals, and improve the safety and environment of state prisons. Making for Change is offering women in a British prison the opportunity to gain qualifications in fashion and textiles and also gaining experience in commercial manufacturing. The project was set up by the Ministry of Justice and London College of Fashion in 2014. It aims to increase employment opportunities for prisoners on release, as there is a shortage of technical skills in fashion manufacturing in the UK. On a final note, Arts Access Aotearoa is calling for nominations to this year’s Arts Access Awards. Please think about making your nominations and celebrating leadership in Arts in Corrections. Original generation time 1.7880 seconds. Cache Loaded in: 0.0507 seconds.